The Kata SB-904 GDC Reporter Shoulder Case is a multi-purpose bag that fits a mini DV camcorder or a Digital or Photo 2-SLR camera outfit. A Modi-Vers divider kit and two small padded inserts are provided. The zippers and openings are all rain protected and an Elements Cover for the entire case is supplied for extreme climatic conditions. Two semi rigid TST front pockets and two large external side pockets ensure ample storage solutions for any additional professional or personal equipment. The bag uses a triple opening system that has been engineered to allow for many working options. Carrying options include a detachable, reinforced rigid handle, BSS "B" shaped shoulder strap and a padded rear and belt loops with removable belt for extra waist support when necessary. (Belt not included). 1680 Ballistic Nylon shoulder Case made to carry photographic gear. Water-resistance is achieved by using specially fabricated Nycore with fluorocarbon based water-repellent finish on the outside and three layers of polyurethane coating on the inside. An Elements Cover emergency rain cover is included in many of our products to protect your case and equipment in severe weather. Two large soft side pockets. The Modi-Vers System allows you to create compartments that meet your requirements. The divider can be cut with scissors to any desired size. You can attach the newly cut divider to another divider or the walls of the bag with a special Touch Fastener connector. TST (Thermo-Shield-Technology) protects your equipment while creating an extremely light product. The outer surface of the TST is thermo-formed in a protective "rib-shape" construction. It is a double cord, water and dust proof, high tenacity and abrasion-resistance fabric. Underneath is a cross-linked, closed cell PE+EVA shield that provides insulation from cold, heat and moisture as well protection from impact and shock. The main double buckle closing flap allows full access to all the equipment at once and is most convenient when loading and unloading the bag. Quick "One Pull" top zippered flap allows for quick access to the working camera at all times. 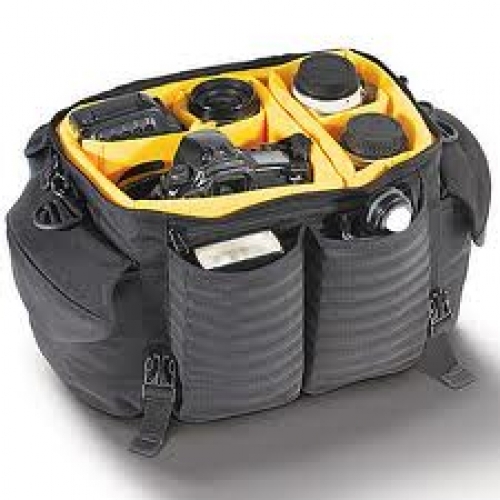 Two side zipper openings enable the quick draw of lenses, flash unit or other accessories, without having to open the bag. Padded rear belt loops for extra waist support when necessary. Digital or Photo 2-SLR bodies with 6-8 lenses (up to 300mm), flash unit, battery booster and many more accessories and personal effects. Nikon D5200 with D-ZOOM KIT: AF-S 18-55mm VRII + AF-S 55-200mm VRII Kit Lenses Nikon D5200 price in india, Nikon d5200m bundle. kodak digital camera, canon handycam, dslr zone, hyderabad dealer, lowest price in hyderabad, best price dslr, special offer, dealer in hyderabad, bangalore outlet, price in bangalore, manfrotto tripods, Lowepro bags in Delhi, camera dealer in palika bazar, palika bazar lens dealer, Manfrotto delhi, Lowepro fastpack 250 lowest price, Delhi tripod supplier, best place to buy bags in delhi. You can shop online for all popular brands and products, Including Professional Studio lights, Lighting equipments, lighting accessories, Studio lights, Umbrella lights, camera mounted flash, battery pack lights, backgrounds for studio, 9 feet x 36 feet paper backgrounds, background systems, top lighting systems, booms, autopoles, Digital cameras, Digital SLR cameras, lenses, Camera bags, camera pouches, camera cases, sling bags, backpacks, tripods, monopods, different clamps, powerpack, elinchrom compatible softbox, prolinchrom accessories, gorillapods, camera straps, filters, LED lights, video lights, adaptors, camera shields, rain covers, black & white films, color slide films, different formats, processing chemicals, slide viewers, slide trays, loupes, Monitors, Heads, head plates, super clamp, spring clamp, hooks, and many many more. 140, Palika Bazar Connaught Place, New delhi -110 001, 08800661344, 011 23351216.